For those of you looking for a great way to keep yourself cool and energetic this summer, check out these healthy vegan desserts below! They are all vegan, gluten-free, and free of refined sugar. Most are also loaded with good-for-you ingredients and healthy fats and protein that’ll keep you going and refuel your body through the summer. Summer has started! Summer 2016 went by way too fast, as it usually does, but that usually means it was full of fun. I always want to take full advantage of the summer and spend it with my family. That means traveling, pools, beaches, family, friends, BBQs, birthdays (my husband and daughter), and even just being lazy at home with my kids, making breakfast, biking, and exploring San Diego like tourists. Let’s just say that when all of us are as tan as can be, I know it’s been a great summer! Along with the warm summer days comes refreshing and cool treats to get us through the day. Below I’m sharing 10 of my favorites from the blog! They are all vegan, gluten-free, and free of refined sugar, and loaded with good-for-you ingredient. They are also fun no-bake recipes to make with your kids (after all, who wants to turn on their oven mid day over the summer). 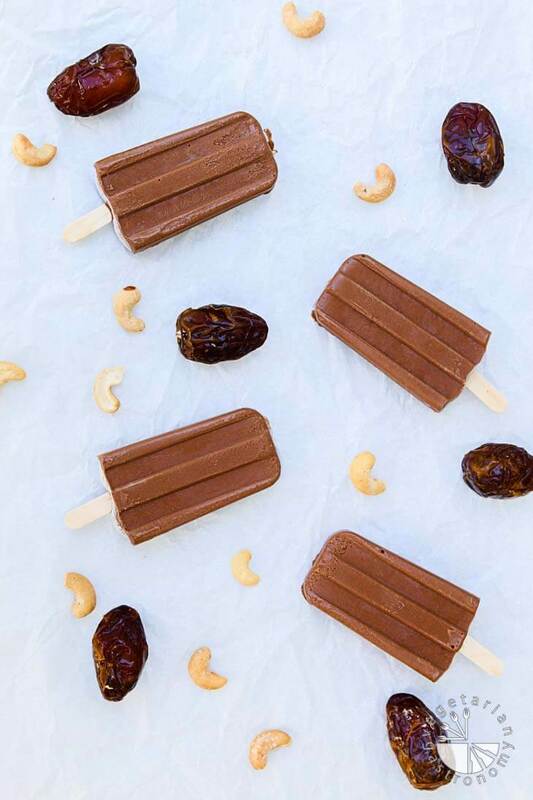 And, if you live in a place like we do where it’s warm most of the year, or like my kids and me, you crave popsicles and smoothies even when it’s cold outside, then you can easily enjoy any one of these refreshing healthy vegan desserts year around. Creamy Chocolate Fudge Popsicles – I call these popsicles “my kids first true love.” It’s the first popsicle recipe I created for my site and it has ALL the components of what my favorite popsicle looks like. I meant to mimic the fudge pops you find at grocery stores but ended up creating something even better. Super creamy, fudgey, rich, chocolaty, and irresistible! I love the way my kids faces look after they devour one of these, and they’re the perfect summer treats to have on hand in the freezer. I also secretly love surprising guests with these vegan, refined sugar free popsicles! 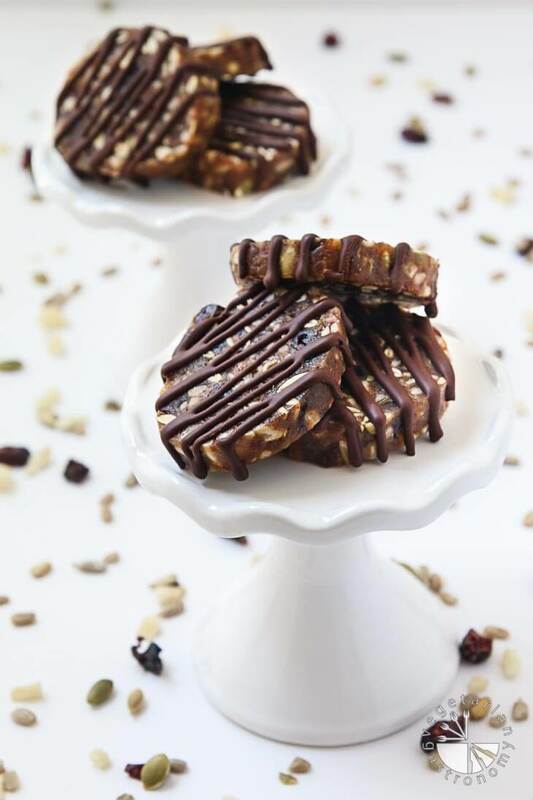 No-Bake Chewy Chocolate Date Cookies – These are perfect because they’re so ridiculously easy to make…just combine the ingredients, drizzle with chocolate, and refrigerate. They’re also secretly healthy (as are most of these treats), and packed with seeds and fruit. They perfect way to fuel your energy mid-day after or before a few hours at the beach or pool. I always end up making a double batch. Tropical Creamy Soft Serve – This quick blender dessert always takes me back to my days in Hawaii. Sometimes you need something cool and creamy that takes only 5 minutes to make and requires very little prep. This creamy soft serve has the perfect blend of ingredients and is completely fruit-based! 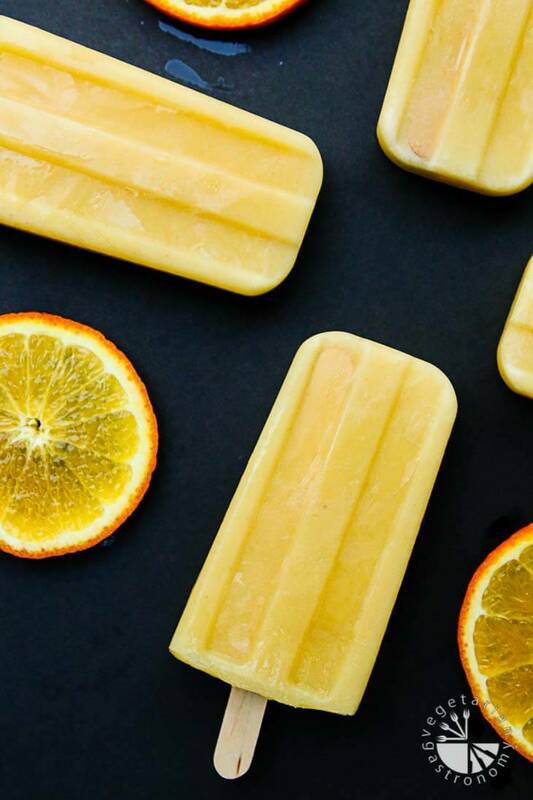 Orange Julius Popsicles – Orange has always been one of my favorite flavors, and there’s just something about turning a childhood favorite into a healthy frozen treat! I still remember to this day my frequent trips to the mall over the summer, sharing a Orange Julius with my dad. 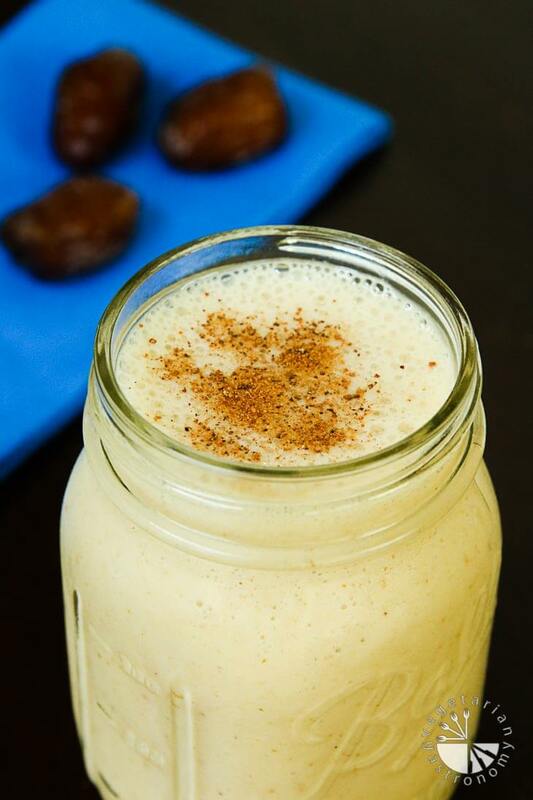 Creamy Date Shake – My husband first introduced me to this shake since he grew up near Palm Springs, where they have the Date Festival and date gardens. Date shakes were a staple for him growing up, and I LOVE them! 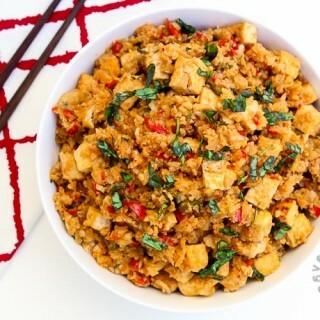 This is my vegan healthier version! 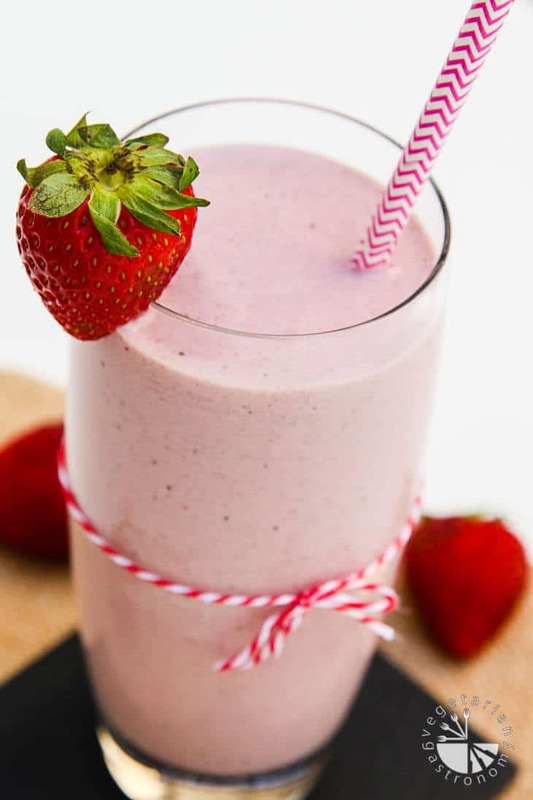 Strawberry Hemp Milkshake – I love introducing new seeds and nutrients into my kids diet, and this milkshake is a great way to incorporate hemp seeds into your diet. It’s the perfect afternoon cool treat! 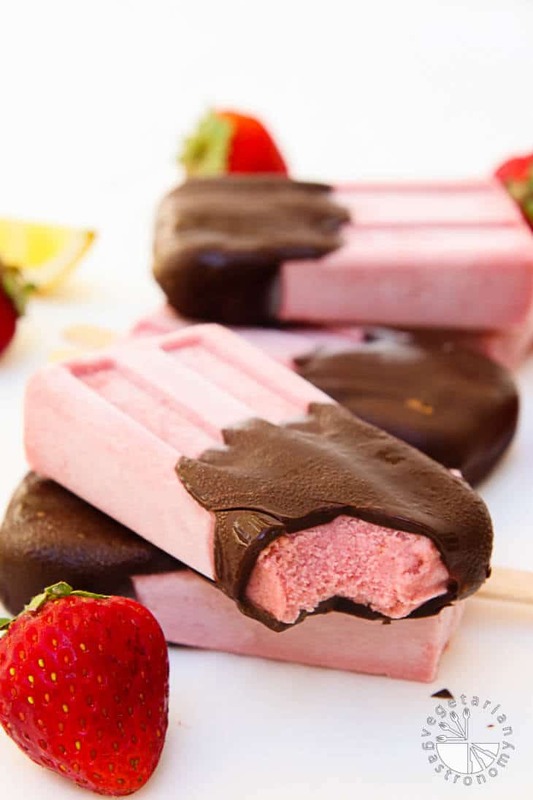 Chocolate Covered Strawberry Cream Popsicles – Like most people, I have a soft spot for dark chocolate covered strawberries! So why not create a frozen treat around them! These popsicles are creamy, vegan, healthy, and covered in dark chocolate (just the way I like my strawberries!). 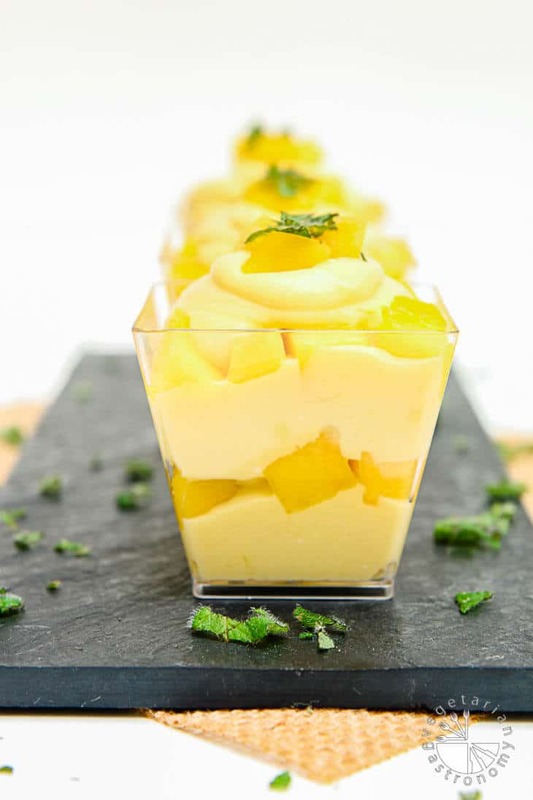 Mango Mousse Parfait – It’s really hard for me to create desserts with mangoes because they’re one of my favorite fruits, so I love eating them unaltered. But I just couldn’t resist using mango puree to make this light fluffy rich Mango Mouse Parfait! 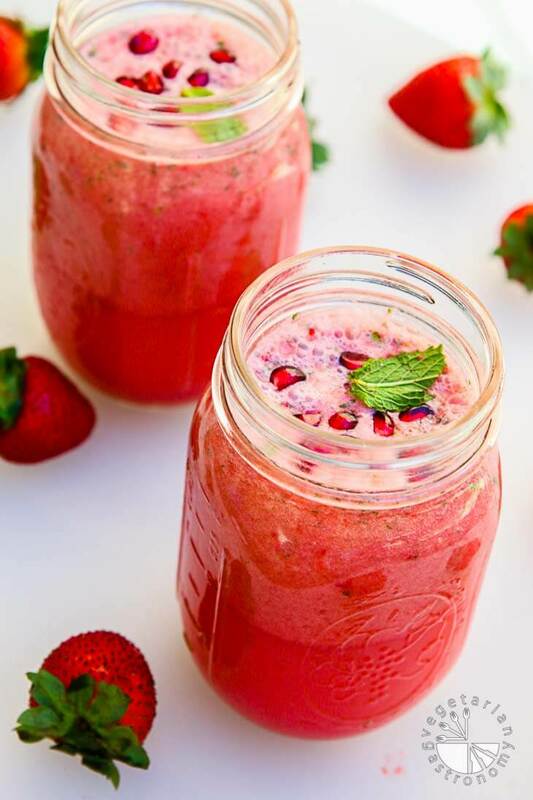 Pomegranate Strawberry Mint Lemonade – Staying hydrated over the summer is key. I’m all for drinking several glasses of water, but sometimes you also crave the refreshing cool flavors of lemonade. This Pomegranate Strawberry Mint version is one of my favorite combinations, especially when my gorgeous pomegranate tree fruits! 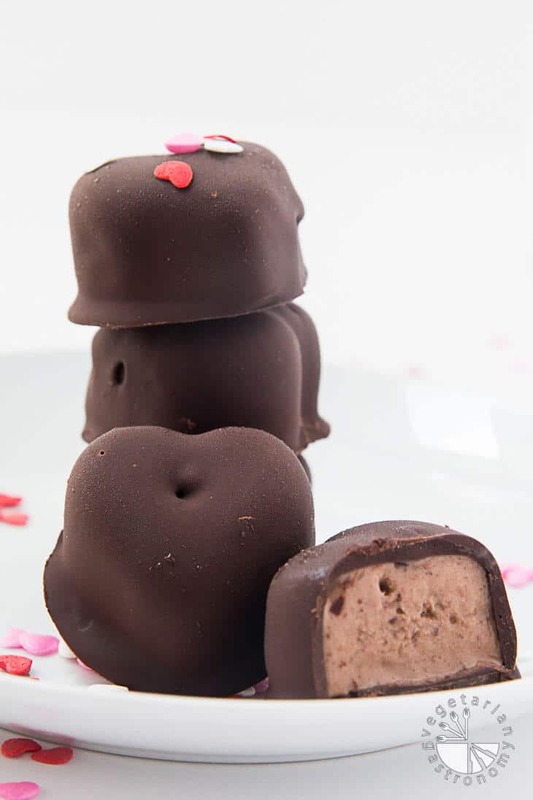 Chocolate Covered Banana-Chocolate Ice Cream Bites – Everyone knows how to make chocolate covered frozen banana bites. 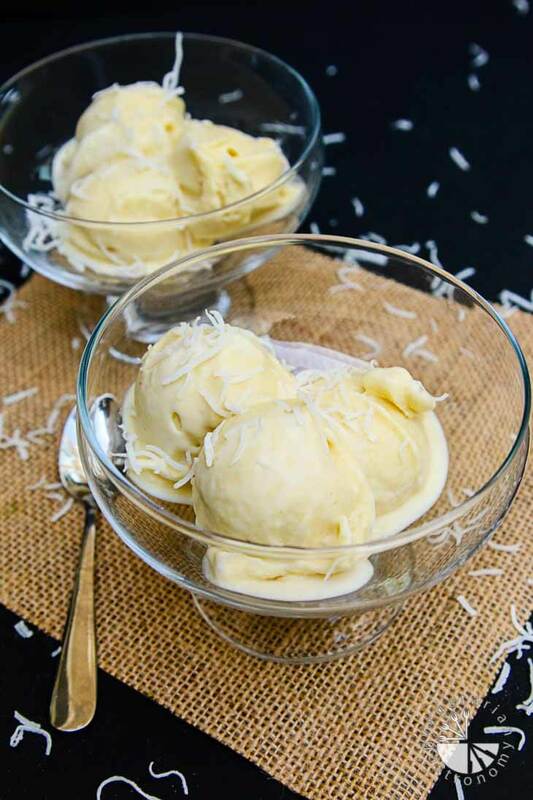 My kids love them, but they’re sometimes a bit too icy for my liking, so I created these easy Ice Cream Bites. They’re a healthier version of a chocolate bon-bon. The best part is that you can make a huge batch and store them in the freezer for those sweet cravings. 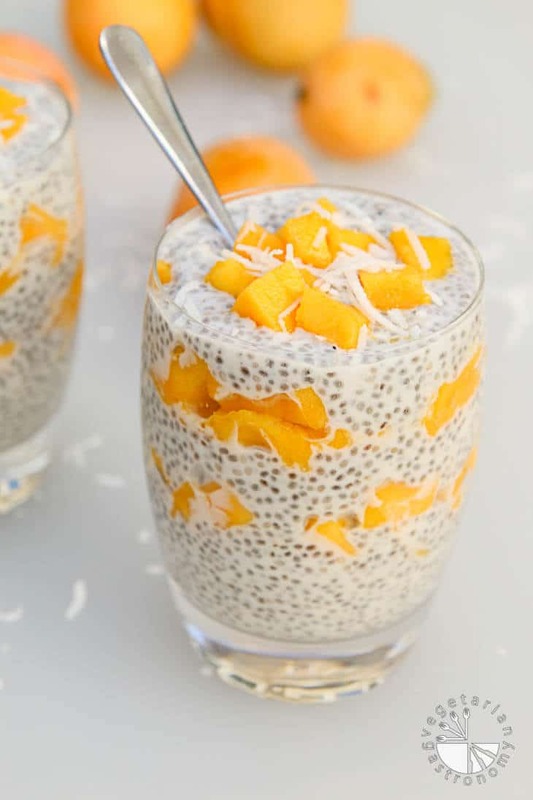 Fresh Mango Coconut Chia Seed Parfait – One of my FAVORITE ways to use fresh mango. This refreshing parfait is perfect for breakfast, afternoon snack, or dessert, and still remains to be one one of my most popular recipes! The summer just started and we’ve already made about half of these listed above! Try one or two (or all of them) yourself, and let me know which ones you love!! 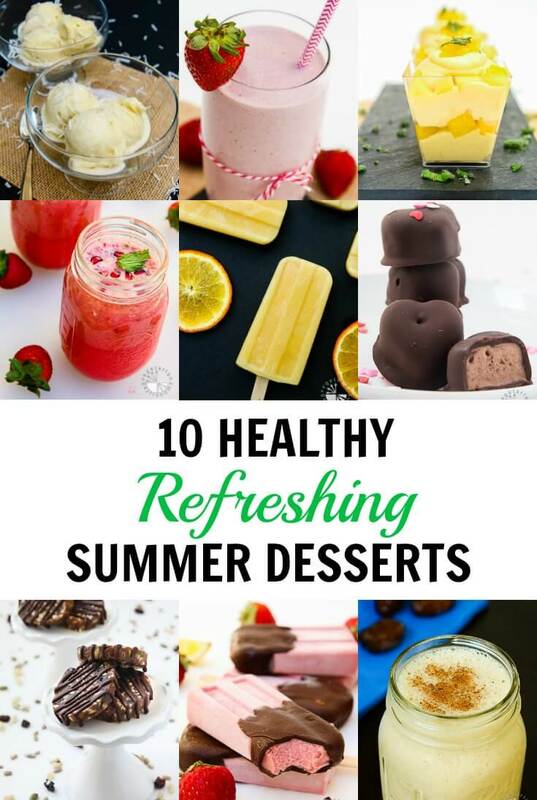 Now that you have my list of 10 Healthy Vegan Summer Desserts to keep you refreshed and energized throughout the next few months, let me know which you’ll be trying first in the comments below! If you try any of them, be sure to tag me on Instagram , with both @vegetariangastronomy, #vegetariangastronomy so I don’t miss it. I love getting the feedback! 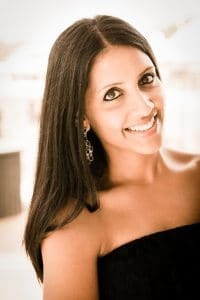 Hi AnjaliThanks for this round up of recipes. We are moving into Spring :) Yay so definitely looking for refreshing drinks and treats. I must try your mango parfait, it one of my favorites. It's one of my favorites as well, along with the creamy chocolate fudge popsicles! Let me know if you try any and thanks so much! Was just telling my sis now that we need to try your chocolate fudge popsicles. They look so fudgy and decadent! YUM. Love the round up and they all look delicious and perfect for any season! Yes those fudge popsicles are to-die-for!!! They're an older recipe, so pictures need updating, but they are so creamy, rich, and delicious! What a great round-up of delicious summer dessert recipes! 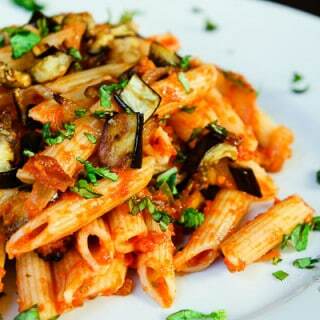 I love how these recipes are loaded with healthy ingredients! The mango mousse parfait is calling to me! Yum! You need to try it then! It's delicious and so easy to make. I love pureeing the mango and using it in all sorts of things! A lovely collection of desserts. Great post. It's always good to have some refreshing ways to satisfy your sweet tooth over the summer! Looks delish! These all look SO good, I love the sound of the mango parfait and the pomegranate lemonade. Thank you!! Those two are delicious! As you've noted many of these treats are actually quite healthy. Much as I love some indulgent ice cream, when the hot weather comes I'm all for refreshing and light - this list is a keeper. Yes! I love coming up with healthier treats to make at home over the summer for my kids! And honestly they taste just the same, if not better, than any store-bought kind! Plus, it's nice to whip out a few of these with the heat! You're a popsicle girl!! My kind...i have one more popsicle recipe coming to you soon and I think you'll love it! Although those fudge popsicles are my favorite, as you know! I'm going to have a REALLY hard time come this fall. My time with them will be even more precious, but yes you're right, it'll be nice to have some time for myself (although I think i'd still rather have them home most of the time haha). These all look amazing! The soft serve is especially calling my name. Great collection of recipes! Thanks Amy! That soft serve is yummy...so easy too! Love using those fruits in ice cream because of how creamy they are. SO MUCH deliciousness all on one page!! Wow, I love this roundup and appreciate how they are all gluten free too. Thanks! Thank you!! Yes, they are all gluten-free, vegan, and healthy! I love coming up with easy fun treats over the summer! These all look delicious :) Thank you for sharing - now we have lots of treats to look forward to trying! You'll love all of them...best part is that they're super easy to make! What a delicious line up of vegan treats! They looks so good I don't know where to start ha ha.